Greasewood Flat: If you've not been to this 30-year-old local favorite atop Reata Pass, then you haven't experienced Phoenix/Scottsdale to its fullest. And one trip will likely not be enough to get a taste (quite literally) of the place. 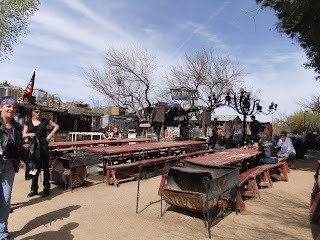 Greasewood Flat is a massive open air dining field of sorts enclosed by a fence made up of old time farm and ranch equipment. You'll sit at one of those picnic tables while eating one of the best burgers ever made and washing it down with a tall cool one or two. There's usually a big bonfire going and if you time it right, a band will be playing. Those country gals and guys will be struttin' past doin' the Country Two-Step and it likely won't be long before you are tempted to join 'em. Reata Pass Steakhouse: Located just next door to Greasewood Flat in the original 1882 stage coach stop on Reata Pass. Even if you are stuffed from that burger I suggested, you'll want to go inside and take a look around, then put it on your list for the next visit. This year we visited the Reata Pass Cavalliere's Farmer's Market, held each Sunday from 10 a.m. - 2 p.m. The booths are tucked in between the two eateries. Homemade pickles, salsa and jams were being sold and the smell of the whole pig roasting on a spit made our mouths water. It was also hard to resist the homemade vanilla ice cream being served right out of the mixer. Pinnacle Peak General Store: We would never have stopped at this place had our friends, whose recommendations we value, suggested it. 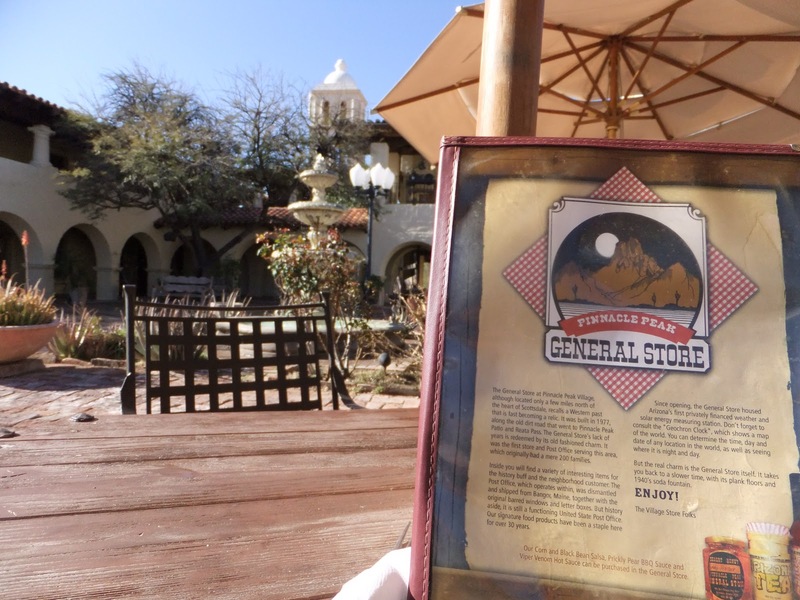 As you are driving past it on Pima or Pinnacle Peak Roads, it appears to be a service station with a sign reading, "General Store" on the adobe hacienda-style building behind it. "You have to have breakfast there!" we were told and so we went. What a find! The interior still houses a post office (like none you've ever seen) and an eating area amidst a museum of country western memorabilia. 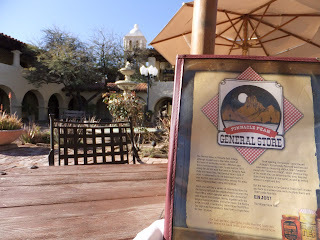 We chose to sit in the sunny courtyard near the fountain with its hacienda-like feel to eat our enormous breakfasts. Overeasy Cafe: Was recommended by a friend in Portland, Oregon who used to live in Arizona. We didn't get to this one, but I checked out the menu and with plates called, "The Crying Pig, The Mile High and The Pollo Loco" (that last one is 'crazy chicken' for you non--Spanish readers), we have it at the top of our 'next time' list. Tomorrow I will tell you about our finds in Tucson. If you have recommendations for Scottsdale/Phoenix please tell us about them by using the comment box below. Thanks for the tip. Another one to add to our next-time list. Dam?! . . . We missed it.